Arrived at Logan at 2pm and checked in through security. Boston to Italy will be a long flight, so 8 hours worth of Italian language tapes should get me by. It was a pretty uneventful flight. As expected Alitalia offers excellent service and after a movie, a meal, the tapes, a few long naps and breakfast, I was looking at the early sun rise over the Alps as we descended into Milano. A quick stop through customs and a gate change to my flight to Palermo took some time but soon I was heading south looking down at the city of Genoa and having a great view of the islands of Corsica and Sardinia. Arriving in Palermo at 11:00am, it took an hour to clear customs, get my car and be ready for my drive to Trapani to meet Giovanni Montanti. I called him on his cell phone and after confirming I was on my way, began the drive south. I first contacted Giovanni the year before, by email, looking to purchase two of his videotapes on Petralia Soprana and The Madonie Region. Over the next year we communicated by email and developed a friendship. When I told him my plans to visit Sicily in April 2005 we agreed to meet. The logistics of this trip made it perfect to stay in Trapani until my brother and Elaine arrive tomorrow. Giovanni's offer to show me his city of Trapani was one I could not refuse and he booked me a room at the Hotel Vittoria. Meeting Giovanni was a great pleasure. We spent the day seeing Trapani. The windmills located on the southern outskirts of Trapani where the salt marshes were cultivated was our first stop. Giovanni wrote to me many times in perfect English, but his ability to actually speak English is as limited as my own poor attempts to speak Italian. Fortunately he brought along an Italian/English dictionary and spent the drive sharing our thoughts and learning about each other. We then drove to the town of Erice in the mountains above Trapani. The winding wooded road took us up 750 meters above the coast for spectacular views of the city below. Words are hard to describe the beauty of Erice. Giovanni said Erice is the most beautiful town in all of Sicily and after walking it's streets I came to believe him. The history of Erice dates back to before Medieval times. The cobblestone paths and stone houses were ancient. Considered a fortress by the Greeks, Romans, and Spanish kings, the town was enchanting and the views breathtaking. Giovanni told me his father was mayor twice of Erice and as a child he grew up in the village. He showed me the park and gardens that he played in as a young boy. After dropping me off at the hotel, we agreed to meet again at 6:00pm to have dinner with his fiancé Leticia. I had a few hours to take a nap and clean up after my long flight. We had a late dinner at a seafood restaurant close to the hotel. The seafood is a specialty in Trapani and my antipasto, pasta and calamari were excellent. Tomorrow we would meet again at 6:00pm, so after getting back to my hotel at 11:00pm, I went straight to bed. I slept in until 10:00am and rose to a wet windy day, perfect for exploring Marsala. I packed up a few things and drove south to see this city. The drive took about 40 minutes and there was little traffic. The old section of Marsala is located just up from the coastline of the city. Parking close to the main gate, I walked the streets of the old quartiere. The shops wee mostly closed and the traffic light so I had plenty of time to myself without feeling rushed. One could easily see the Arabic influence in these western Sicilian towns. Palms, cactus, eucalyptus, and oleander were scattered throughout the streets and roads. There was so much here that reminds me of my home in California. The weather is identical to where I lived. Wet, rainy spring days followed by hot, dry summers and a temperate winter. I left the cool rainy spring of California to arrive in the cool rainy spring of western Sicily. Back in time to meet Giovanni, Leticia, his brother Gregory and his wife. We chatted (as best we could) until it was time for me to head back to the Palermo airport to pick-up John and Elaine. We agreed to meet again around 9:00am at the hotel. John's flight arrived early just as I got to the terminal. In minutes we were headed back to Trapani and after checking in we went for a walk through the old district of Trapani and had a late dinner before retiring for the night. I arose before John and Elaine and checked out early and took a walk around the hotel. It was another rainy cool morning. We met Giovanni at the hotel and my brother and Giovanni chatted some as we enjoyed a coffee and breakfast. Giovanni soon had to leave for work and we said our good-byes but not before I thanked him for his generous hospitality and fantastic welcome to my first days in Sicily. After another stroll around the old quarter of Trapani we loaded up the car and began our trip to Petralia Soprana. The weather was cold and blustery as it was raining and foggy along the autostrada through Palermo and Termini Imerese. We took the autostrada towards Catania and discussed our adventure while taking in the view of the Madonie mountains shrouded in fog and rain clouds. Exiting at Resuttano, we would up SS120 through the town of Alimena and into Bompietro. I showed John and Elaine the first street as one enters the town from the south: Via LoDico. Outside of Bompietro we came across a shepherd and his flock of sheep blocking the road. As he crossed our path and headed up into the green hills of the rolling countryside, so did we continue our journey into the dense fog towards Petralia. Soon we were in the main square, Piazza del Poplio (the People's Square) and found Lucia's small bar. We made our introductions, paid for our apartment and was shown the place. It was just perfect for us. Two bedrooms a bath and a side living room with a small efficiency kitchen. We settled in and let the rooms heat up as the weather at this elevation (3300 ft. / 1100 meters) was cold. The town was in a deep fog and rain. While John and Elaine napped I took a stroll in the rain and smoked a cigar. Just up one block from out apartment was the Fontana d' Quattro Cannoli (the fountain of the four water pipes) and a block or so further was the church of Peter and Paul. By 8:00pm we were ready to take in a late dinner and after getting directions to a local restaurant just 2-3 km. outside of town we tried to find it. It was an adventure as we drove around lost in the fog for almost a half hour. Finally after asking for directions twice we found the restaurant: Cerasella, and had a great meal of an antipasto, pasta and mushrooms, roast lamb and potatoes. The local red wine was excellent. Our host spoke a little English and helped make the meal a pleasant one. On returning to our apartment we were greeted by a woman and three children who asked if we were the LoDicos. It turned out she (Mimma) was also a LoDico and took us back to Lucia LaPlaca's bar to meet more of our family: Pietro LoDico. I hurried back to the apartment and brought my small notebook computer to show them some of the historical family tree. Soon everyone was enjoying the moment. Francesco, Lucia's son was pouring Muscato wine and toasts were being made. 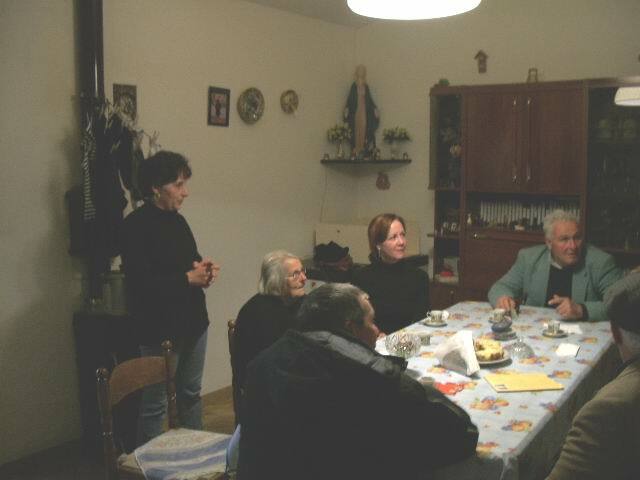 I showed Pietro and his family the LoDico names and they took notes on birth dates and names to ask more family members about their genealogy. 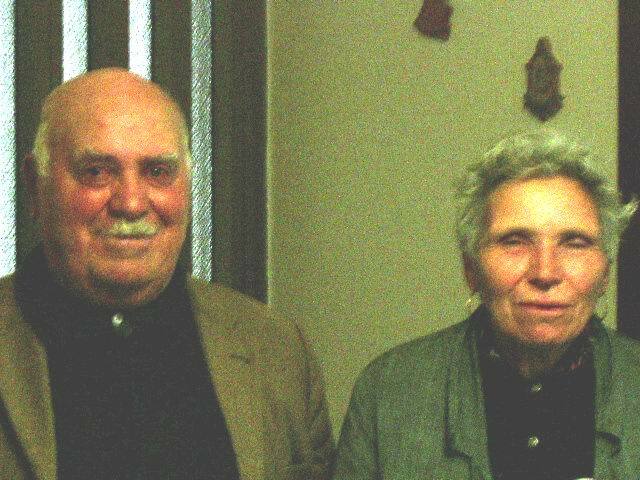 Even Lucia and Francesco LaPlaca were surprised at the number of LaPlaca names within the LoDico family tree. The three little girls: Liliana, Maria Grazia and Mariella indicated they had computers in their school so I gave them my business card with my on-line genealogy web site. We agreed to meet again tomorrow and said our good-byes for the night. I awoke around 7:00am to the soft sound of the church bell that rang out on the quarter hour. Petralia in the late hours of the night through the early morning hours is very quiet. There is little auto traffic as most cobblestone roads are too narrow to support cars. Since our apartment is set back from any road bearing car traffic, our only sounds at night is the patter of rain on the stone and tile roofs. Around 8:00am as I was making coffee a lone voice, almost like a call to prayer was heard from somewhere in the village. By 9:00am I made coffee in the kitchen and awaited John and Elaine to get up. Slowly the town seemed to come to life as people began to go to work and the local shops opened. Once up and dressed we headed out of town to visit Santa Caterina LoDico, the small 'fratzione' of Petralia Soprana. We drove down as far as the road took us eventually coming to a dead end. As I backed up and attempted to turn around on the narrow road a door opened and a gentleman peered out at us. John stepped out of the car and introduced himself. The man indicated he was Giuseppe LoDico and agreed to walk us up to the home of Leonardo and Franca LoDico. Soon we were standing in the living room of Leonardo and Franca trying to communicate who we were and how possibly we were related. 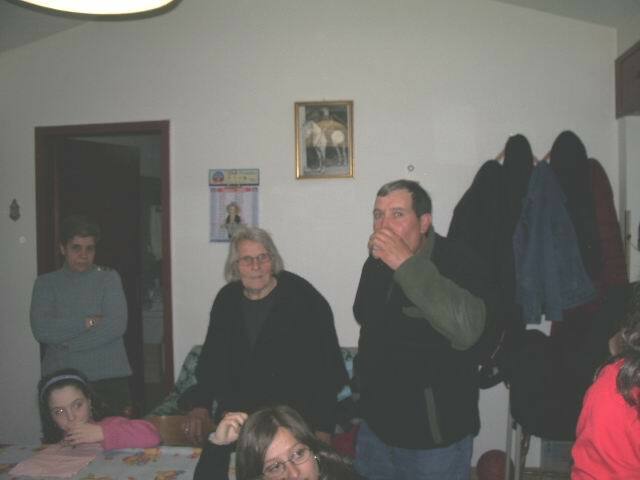 As it turned out Mimma had already telephoned Franca and soon more relatives showed up. Since I had spent most of the morning going over my notes I was somewhat prepared to try to show them just how we were related. With the help of Pietro's mother, Maria Santa, I learned the first LoDico to settle in Santa Caterina LoDico was Leonardo LoDico who married Maria Santa Gennaro. The closest match I had in my family genealogy was a Leonardo LoDico, married to a Maria Santa Fornaro. What was the chance I had made an error in the transcribing the handwritten birth record on microfilm? I had already reviewed all my other descendant charts for every LoDico in Petralia and it was only the descendants of Domenico LoDico, my great [6x] grandfather's brother that settled in Santa Caterina LoDico. Franca asked us to return later that evening for dinner and Mimma asked us to meet her at 4:00pm at Lucia's bar to travel together. We left Santa Caterina LoDico and headed south to Blufi. We had little time to explore the town before we had to head back to Petralia so Elaine could keep a 2:00pm appointment with Mimma's daughter; Maria Grazia. We had about an 90 minutes free down time to catch a quick nap and get ready to meet Mimma at Lucia's bar. At 4:00pm we walked over to Lucia's and met Mimma and Maria Grazia and drove over to Leonardo and Franca's home. We were armed with my computer, my genealogy CD, two Italian/English dictionaries and one French/English dictionary. We had discovered that Franca's daughter Mariella was taking French in grade school and Elaine was quite fluent in French. The evening will always be one of my fondest memories of any visit to Sicily. From Sicilian to Italian to French and then English and back we began to bond as a LoDico family. Franca brought out her wedding book of photos and we saw her entire family from the 1981 photos. Three generations of Santa Caterina LoDicos were shown to us. Now armed with my notebook computer we scrolled through the long list of LoDico descendants and my handwritten notes depicting how our two ancestors: Mauro and Domenico were brothers, growing up in the quartiere of Malpasso, in the village of Blufi, a fratzione of Petralia Soprana, back in the year of 1790. Two LoDico families separated by 265 years and six generations of descendants sat together, once again for a family dinner. I could still see that the missing information on the direct link for Pietro father to the information on my Leonardo was a question mark and while I tried to explain my on-line genealogy searches only gave me access to around 1920, it did not seem to translate well and more questions were asked on why I did not have the actual information on my computer. I brought out my genealogy CD which I had created 3 copies of and showed it to Mariella. Earlier in the day I had asked if anyone had a computer and she said she had one in her room but it did not have an internet connection. We went upstairs and put the CD in her computer and Franca, Mimma and the girls gathered around me as I showed them photos of my family and how to navigate around the CD. Finally we seemed to have a universal language as I asked Mariella if she had a PDF (Acrobat Reader) and she did, so I could show her the descendants outline information. I then asked if she had Excel so I could show her the spreadsheets of various miscellaneous descendants I had not yet placed into my family tree. I opened one spreadsheet: Petralia Soprana births 1820-1920. I should explain now that over the last four years I had looked at every birth, death and marriage record in Petralia Soprana for this 100 year period. They are available on microfilm rolls from the Mormon Church, for rent and they are sent locally to me in Santa Cruz, California for my viewing. When I first started logging all the LoDicos I found it best to use an Excel spreadsheet format where I could group and search data quickly and easily aligning families and siblings. As my family tree grew I would find people in the spreadsheets that fit into my tree and slowly I would remove them from my spreadsheet. In the beginning I might have had 200 names in one spreadsheet but in the end maybe 10 remained, a LoDico I just couldn't place within a specific family grouping. So as I opened this spreadsheet, just to show everyone the various information I had on the CD, up came about 10 LoDicos that remained on the spreadsheet. 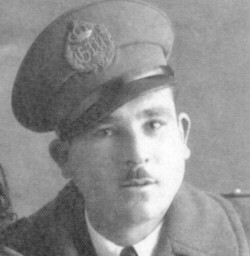 One name jumped off the page as we all saw it at once: Pietro LoDico, born 9/3/1901 to Leonardo LoDico and Maria Santa Gennaro! There was a side note indicating they lived at Santa Caterina LoDico #69 and Pietro wed Calogera Cerami on 1/11/1920. There was even Pietro's sister Vittoria listed. Obviously I had not made the connection that Maria Santa Farnaro was actually Gennaro. (If one ever looks at a Sicilian handwritten town record you would understand how difficult it is to read a century old penmanship. Everyone hurried down to announce we had discovered the link to the family tree. Dinner was served at 9:00pm. Roast pork, artichoke fritters, potatoes, salad, cheese, Leonardo's white wine, and homemade bread. It was wonderful. One cheese was a local ricotta known throughout Sicily. Unlike the American version this ricotta is white and solid, made that way by the use of salt (another local industry is the extensive salt mines in Petralia). The ricotta was mixed with red peppers to give it a wonderful flavor and texture. Local tangerines and blood oranges and a hot espresso coffee topped off the meal. The night ended around midnight and we drove home loaded down with a large bag of oranges and tangerines and memories. "Yes, will you go away too. When you get older. Will you leave me?" "No Domenico, I won't leave you. I promise"
After two and a half centuries I could almost hear Mauro whisper, "I am home, I am here Domenico". I rose early like the paisani of Petralia Soprana and took a walk through the town as the shops opened and the older men gathered in the piazza. The local bread shop which made bread every day early makes this wonderful light pastry bread topped with sugar. Sicilians love their sweets. Mimma came and took us for a tour of the local flour mill. We saw how the raw wheat was separated from the straw and pebbles and eventually refined into a few basic flour grades. Some were for fine semolina and baby food, others for bread and rising dough and others for pasta. They even made a coarse grade for animal feed. 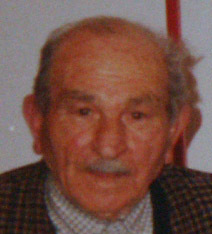 Mimma's husband Vittorio drove a delivery truck for the company and was in his 23rd year as an employee. We had some time before meeting more relatives with Mimma so we walked through the town of Petralia Soprana seeing the sights and exploring the cobblestone alleys and pathways. We had only an hour or so before we returned back to the main piazza. Mimma was there to meet us on our return and she took us for a tour of the churches. It was during the tour of Chiesa Madre [Peter and Paul] that we learned the quarter hour bells that rang around the clock was all done by hand. We had the opportunity to meet Father (don) Calogero LaPlaca who spoke English and helped in the translations back and forth. Later we met more LoDicos: Rosario and Gianluca, the sons of Domenico LoDico, the brother of Pietro. I agreed to meet up with them Thursday and show them my genealogy research and let them copy the genealogy CD on their computer. Meeting back in the main piazza that evening we met more friends and family of our relatives and was introduced to the mayor: Pietro Puleo who I had emailed a few times. Again I sampled the Muscato, a sweet golden colored wine made in Marsala, that was excellent. We called it a night to prepare for the next day with Pietro and spending time back in Santa Caterina LoDico. Thursday dawned with the promise of our first sunny day. Everyone had their laundry hanging to dry and set about cleaning up their houses and shops, as we got on the road by 11:00am and met with Pietro at his house. We had a quick look at his home, had coffee and headed out to the local cheese factory for our second tour. The cheese factory was about 5 miles away on the other side of Santa Caterina LoDico. It sat on the opposite hillside of Pietro's house, overlooking the same lush green valley. Inside we were taken on a tour and watched two complete processes: the making of provolone cheese from cow's milk and the making of ricotta from sheep's milk. Later we sampled the fresh cheese, especially the warm ricotta straight from the processing vat. The ricotta cheese from Petralia Soprana, made in Santa Caterina LoDico is famous throughout Sicily. They also make a wonderful hard ricotta, flavored with either red or black pepper. The addition of salt, most likely from the salt mines in the hills around Petralia, turn the ricotta into a harder, wonderful textured and flavored cheese. Back to Pietro and Lucia's home we spent the afternoon seeing his working farm. There were apple, orange and almond orchards. A barn housed cows and steers. Another barn housed his hay while about 10 dogs throughout the property guarded the chickens and ducks. 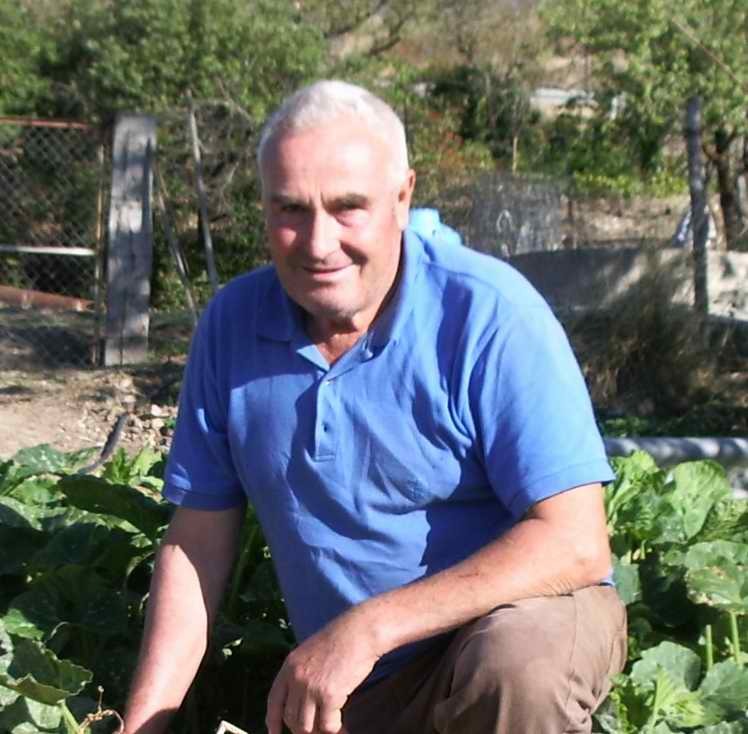 Pietro did heavy construction work and still another barn housed his tractors, jeep, compressors and bulldozers. Their house was a wonderful mix of stone tile floors, large windows, fireplaces, wood burning stoves and a number of kitchens, working rooms and bedrooms. Soon the children: Mariella and Rosalina returned from school and Leonardo and Franca joined us for the meal. We feasted on pasta with eggplant, grilled sausages, veal, salad and Pietro's wine. Dessert was cheese and fruit followed by sweets. Hardly able to rest we agreed to meet the Lucia and Pietro back in town so we could meet Lucia's parents. 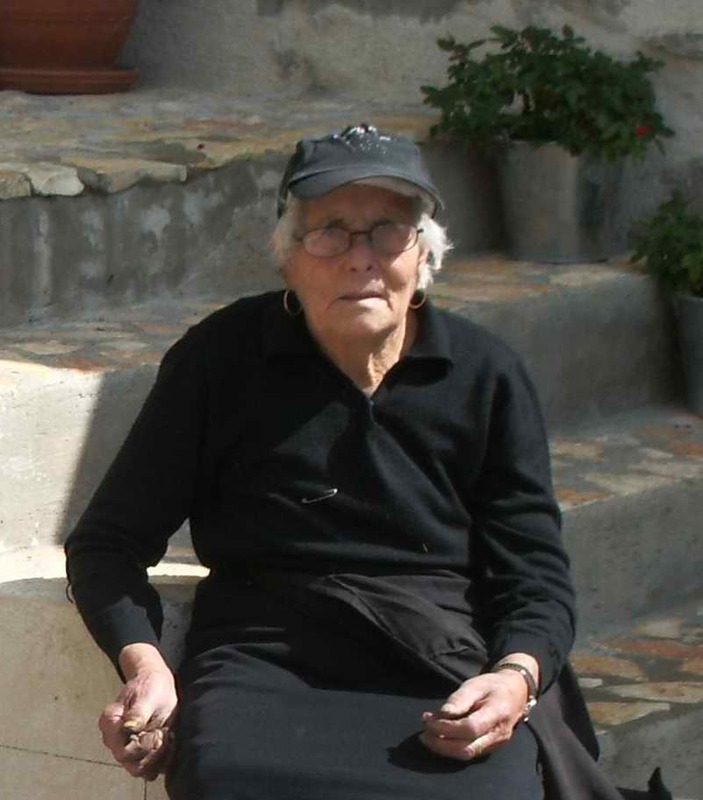 Lucia's father would be 91 on Sunday. My brother John offered to cook for the entire family and after some translation errors and coordination of times and how he could do this it was finally agreed for Saturday night at 7:00pm. I made it back by 4:00pm to meet with Rosario and Gianluca at their home. Luckily someone invited a neighbor woman: Santina, who spoke English and we were all able to finally speak and understand each other. 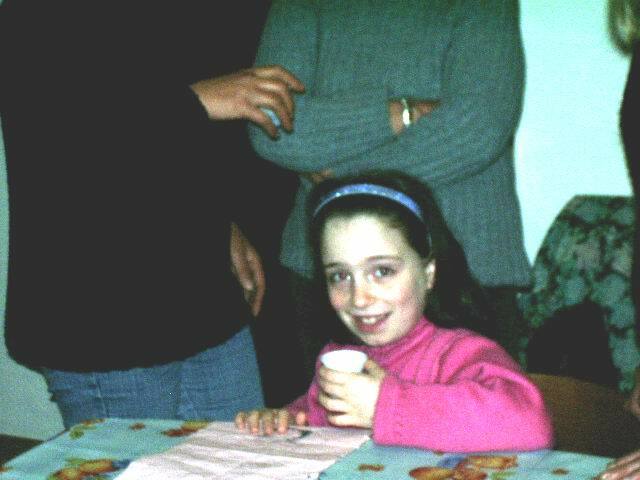 Rosario was going to the university in Palermo and Gialucca was just finishing high school. They had a younger sister Valentina who was about 12 years old. Their mother: Grazella, showed me her wedding photos and most of the family photos. Later I gave Gianluca my genealogy CD to copy and once done we all gathered around his computer to show photos and files and spreadsheets on the disc. I was surprised to learn that Gianluca and I shared one thing in common: we were both allergic to nuts. He is the first relative I have met with the same allergy as myself. We met Pietro and Lucia in town and walked up to their parents house. It was close to 8:30pm and we had napped some during this long exhausting day. Lucia's father would turn 91 on Friday but the family had a birthday party planned for Sunday. Later when we tried to explain we wanted to catch a late dinner and retire Pietro and Lucia insisted we come back to their parents house if nothing was open. After a walk back to the two places in town we could eat we returned to Lucia's parents and had a light but very filling dinner. We made it home around midnight totally exhausted yet thrilled at another wonderfully fun filled day. There was talk earlier in the week that everything would be closed today due to the Pope's funeral however that changed by mid-week and we learned a 'mercato' (market) would be in town and after breakfast we walked down to the main road to see what was for sale. Merchants were set up in a long row on each side of the street. One side had all fresh fruits, vegetables, meats and fish. The other side had clothing, shoes, kitchen items, leather and wool goods. I bought a sweater set for Cindi and a travel bag for myself. We also bought most of the food for Saturday night and some staples for ourselves. It was another sunny day and after spending time eating a lunch of dried sausage, cheese, coffee and sugar cookies we once again explored the town. Elaine and I searched for a plastic headband to replace the one little Liliana had broken the night before. The cultural differences were beginning to become evident to me. Small children, ages 6 and 8 interacted with teenagers age 14 to 18. Children can easily play out of sight of parents with no concern. All of the children that were our cousins were well behaved and enjoyed a rich full life. Lilianna took dance lessons. Rosalina played clarinet. There was school six days a week, including Saturday. Mariella, age 18, a time when you would think a girl would not want to hang out with her parents was perfectly comfortable staying with her father and mother than cross the street and chat with all her friends, even one boy who she said was cute. Perhaps in the larger cites like Palermo, Trapani, and Messina things were more like our faster paced American culture, but here in the remote Madonie time seems to have insulated these people from the outside influences and they seem all the more enriched by it. During one one walk around town I discovered that the local library was just around the corner from our apartment. I was told by Giovanni from Trapani that Rosario Ferrara, who ran the library was a great source of local information and would help me look up anything, if I wanted it. I also ran into Father LaPlaca and invited him to dinner on Saturday. In turn he invited me to Mass at 11:00am on Saturday, a special Mass for the Pope. We ran into Gialucca and was invited to witness band practice in the piazza of Peter and Paul. While drummers beat out a steady rhythm a large pole with a banner emblazoned with the town seal was brought out and Gianluca balanced it on his arm, then shoulder, and chin. Each member took turns practicing and a smaller version was used by the younger boys. The pole weighed 50 kg. The piazza filled with people (about 20) to watch. From this vantage point we could see the town of Gangi sitting on a distant hill and Mount Etna capped in snow. Elaine found a cake (torta) and two candles; a nine and a one for Lucia's father's birthday and we prepared it and brought it over to him as a surprise birthday gift. Later that night we returned when Lucia and Pietro came to town and shared it with everyone. Lucia's son Sandro came to visit from Palermo and we introduced ourselves and discussed more of our family's rich history. Sandro told us that his grandfather served in the Italian army during the war and was a prisoner at Auschwitz but escaped. Unknown to John and myself there was a funeral for don Giuseppe LoDico that afternoon. Giuseppe was one of the founders and directors of the local Soprana band. Elaine, during one of her walks ran into the funeral procession and met up with many LoDicos, and was taken, arm in arm with the LoDico family, to the local cemetery where Giuseppe was interred. On passing the local Carabinieri (police) station, a few policemen, in full uniform stood at attention and saluted the procession. Laster I discovered Giuseppe was a policeman. 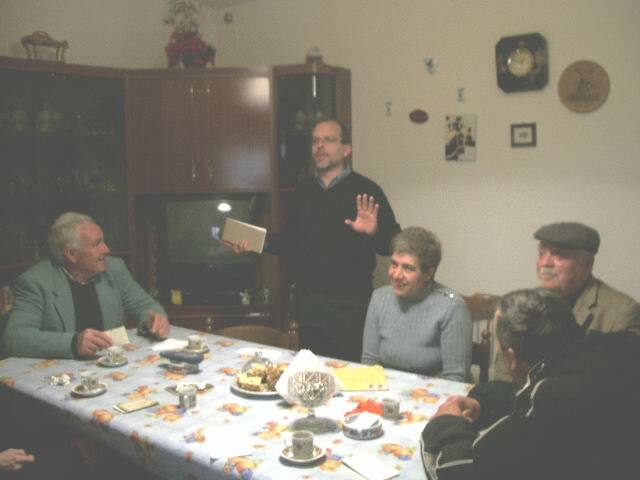 In my email discussions with Leonardo Cancillari and in reading and hearing from the townspeople I knew Giuseppe was very much respected in the community and I had hoped to meet him on this visit. Returning to the main piazza that evening we ran into Mimma, Vittorio and Sandro and we all went into Lucia LaPlaca's bar for drinks, more talk and a final good-night before we retired around midnight.